The Republic of Tatarstan, Yelabuga region, Yelabuga, the territory of the SEZ "Alabuga"
Alabuga (Russian: Алабуга) is a special economic zone of an industrial and production type located in a 20 km² area in the Yelabuzhsky District of the Republic of Tatarstan in the Kama Innovative Territorial Production Cluster 10 km from Yelabuga, 25 km from Naberezhnye Chelny, 40 km from Nizhnekamsk and 210 km from the regional center — Kazan. The shareholders of the management company of the SEZ "Alabuga" are the Russian Federation through the JSC "Special Economic Zones" with 100% state participation (66%) and the Ministry of Land and Property of the Republic of Tatarstan (34%). As of 2016-2017, "Alabuga" is the largest and most successful special economic zone of industrial and production type in Russia, accounting for 68% of total revenue (2017) and 42% of tax collections from all SEZs of the country (2016), providing 54% of private investment in Russian SEZ (2016). In the 1980s, the right bank of the Kama river was a promising industrial centre. In the vicinity of Naberezhnye Chelny, the auto road and railways communications were established; KamAZ was showing new industrial capacities; the Plant of Transport Electrical Equipment and the Cardboard and Paper combine enterprise and the Nizhnekamsk hydroelectric station were launched. In 1984, the Council of Ministers of the USSR decided to build a Kamsky Tractor Plant [ru] (KamTZ) in the Yelabuga area, including a universal tractors plant, along with an engine plant, a fueling equipment, a turbocharger, a foundry and forging and a machine tool producing plants. Nikolay Bekh, the director of the “KamAZ” foundry plant, headed the Directorate of the future plant. The general plan of “KamTZ” was prepared under his supervision. The project, commissioned by the Ministry of Tractor and Agricultural Machinery of the USSR, was designed by “Giprotractorselkhozmash” from Kharkiv; its main contractor was the production association "Kamgesenergostroy". The first cubic meter of concrete was laid in the foundation of the future plant on 12 October 1984, and the next year the construction of apartment houses, factory buildings, boiler station, treatment facilities and the road from the highway Kazan - Naberezhnye Chelny highway to the plant site were launched. By 1988, six buildings of the plant were installed, a combined heat power plant was built, 90 kilometres of high-pressure gas pipeline from Udmurtia were laid, and four samples of an experimental tractor were put up, but Mikhail Gorbachev doubted the expediency of a huge tractor production. In July 1988, the Council of Ministers decided to reorganize KamTZ into the Yelabuga Automobile Plant (YelAZ), which was subordinated to the Ministry of the Automobile Industry by order of August 9, 1988. It was planned to launch a mass production of city cars, “Oka” in particular, on the YelAZ site in 1989-1995. The plant also negotiated the creation of a joint venture with Fiat for the production of Fiat Panda and the jointly developed "A93" model, but the Italian company delayed the signing of the contract, waiting for the political crisis resolution on which the project financing depended. Because of a lack of funds, the launch of YelAZ was postponed from 1991 to 1992. In November 1991, Gorbachev put the plant to the jurisdiction of the Republic of Tatarstan and, thanks to the support of the President of Tatarstan, Mintimer Shaimiev, the enterprise managed to avoid closure after the collapse of the Soviet Union. The main subdivision of YelAZ in the 1990s was the machine tool producing factory, which was launched in 1992 and supplied large car manufacturing factories and oil refineries. When in 1997 it reached the breakeven point, about one thousand people worked on a territory of 100 thousand sq meters. The republican authorities also revived the idea of car production and in late 1995 reached crucial agreements with the concern of General Motors. In early 1996, a joint venture “YelAZ-General Motors” was established with $250 million of authorised capital, 25% of which belonged to US investors, the rest - in equal shares to Tatarstan and Russia. The Chevrolet Blazer SUVs, produced in Brazil, were assembled at the YelAZ-General Motors sites, and ElAZ directly dealt with third-party orders for tools, machine tools and spare parts, and together with the French company produced beet harvesters. The first 120 Chevrolets left the assembly line in March 1997, and by the end of 1998, it was planned to open a production complex of a joint venture in the 601st building of the industrial site and to increase car production to 50 thousand per year. The Yelabuga — Kazan — Moscow — St. Petersburg dealer network began to work, and to reduce the car selling price, the government of the Republic of Tatarstan reduced the property tax rate for “YelAZ-General Motors”. However, the financing of the tripartite project was slipping: for example, in mid-1997, journalists pointed out that only 20 million roubles (3.456 mln US Dollars) instead of 120 (20.74 mln US Dollars) were delivered from the Republican budget, while the Russian Federation provided only 1.7 million (0.294 mln US Dollars). After that, the existing mechanism of the project funding was abolished by order of the Russian president on 8 July 1997. In order to attract funding and to overcome unemployment in Yelabuga, the republican government turned to the widespread practice in Russia of the 1990s of creating free economic zones designed to stimulate the regional economy through tax breaks and the attraction of foreign capital. The Law of the Republic of Tatarstan "On Free Economic Zone «Alabuga»" was adopted on April 22, 1998, by 33 votes of deputies of the State Council of the Republic of Tatarstan; one deputy voted against it. The FEZ regulations were developed together with the Customs Committee of the Russian Federation, the Ministry of Finance of the Russian Federation, and the State Committee for Property Management of the Republic of Tatarstan. The FEZ residents were exempt from all tax payments, except for unified social tax [ru] and personal income tax. Despite the fact that in 2001 the American company left the joint venture "ElAZ - General Motors", the FEZ continued its work. By 2003, 13 companies were located in the FEZ, including the “Skantat” joint venture with Volvo, which produces buses on the KamAZ chassis; the Minski Traktarny Zavod tractor production; the meat-processing plant “Modul”, the car chemicals production “D Plast-Eftek; the manufacturer of special machinery on the cargo chassis "AutoMaster"; a factory of office furniture and trade equipment "ElTons"; the manufacturer of building components "DSK KMK" and the joint venture for the heaters production "Delonghi - ZASS «Alabuga»”. The law "On Free Economic Zone «Alabuga»" contained some fundamental differences from federal legislation related to the industrial and production specificity of the site and the desire of the Tatarstan authorities to avoid the use of FEZ for tax evasion. The republican prosecutor's office considered that these differences contained violations of the Civil Code that restrict citizens' rights to engage in entrepreneurial activities, and protested the law during the discussion of the amendments in September 2001. Deputies of the State Council of Tatarstan appealed to the economic expediency of "Alabuga", but the prosecutor's office was not satisfied with these arguments and demanded that Supreme Court of Tatarstan regards the law as contradicting the federal legislation. The Supreme Court of Tatarstan refused to do it, and the Tatarstan prosecutor's office appealed against the decision in the Supreme Court of the Russian Federation. Despite the absence of a direct ban on the creation of free economic zones with special economic regimes in the federal legislation, the Supreme Court of Russia took the side of the prosecutor's office, and qualified the creation of FEZ to be beyond the powers of the Tatarstan State Council and on March 21, 2003 abolished the law "On free economic zone «Alabuga»”. On April 23, 2003, the State Council officially terminated the law on the territory of the republic. 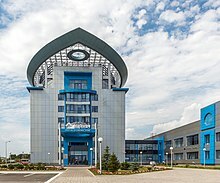 To fulfil the obligations to provide tax benefits and implement investment projects for the residents of the free economic zone, the Government of Tatarstan established the "Directorate of investment programs on the territory of the industrial site «Alabuga»", which fully complied with federal legislation. The Directorate became the legal successor of the free economic zone, and the former territory of the FEZ was transferred to its management. In 2004, four production projects with 3 million dollars of investment were launched on the site. The Tatarstan project attracted the attention of the Ministry of Economic Development of the Russian Federation during the work on the new law regulating free economic zones. Representatives of the Directorate of investment programs were invited to the working group for drafting the bill, and after the adoption of the law "On special economic zones" in July–August 2005, Herman Gref visited Yelabuga. The project of the special economic zone in Yelabuga became one of the winners of the competition for the creation of the first two SEZs. On December 21, 2005, the Government of the Russian Federation issued Resolution No. 784 "On the establishment of a special economic zone of industrial type on the territory of the Yelabuga district of the Republic of Tatarstan". The tripartite agreement, signed on 18 January 2006 between the Ministry of Economic Development and Trade of the Russian Federation, the Government of the Republic of Tatarstan and the administration of Yelabuga municipal district, obliged the Russian Federation and the Republic of Tatarstan to jointly finance the engineering, transport and social infrastructure of the SEZ. The open joint-stock company "Special economic zone of industrial and production type «Alabuga»” (JSC “SEZ IPT «Alabuga»") was established on 24th July 2006. JSC "Special Economic Zones", completely owned by the Russian Federation and the Ministry land and property relations of the Republic of Tatarstan, became its shareholder. The Grand opening of SEZ Alabuga was held on 20 November 2007. It was attended by the President of Tatarstan Mintimer Shaimiev, the head of the Federal Agency for Management of Special Economic Zones [ru] Mikhail Mishustin [ru], the Minister of Economic Development and Trade Elvira Nabiullina, the Deputy Minister of Industry and Energy Denis Manturov and the Deputy Prime Minister Sergei Ivanov. Power supply of "Alabuga" comes through high-voltage substations "Toima-2" with a capacity of 100 MW and "Shchelokov-500" with a capacity of 250 MW. A 600 MW distribution substation, designed to minimize the risks of voltage change and provide uninterrupted power supply even if power supply from one of the substations would be cut off, was put into operation. Water supply is organised through a purification station that receives water from the water intake "Turaevo", located 65 km from "Alabuga". Household sewage of resident enterprises undergo treatment at local treatment facilities and, through the system of self-pressure sewerage, are directed to treatment facilities of Yelabuga municipal district. Heating supply of "Alabuga" is provided by the heat sources of resident companies and operating boiler houses of Yelabuga power and heating plant [ru] with a (designed) heat output of 420 Gcal/h. For a long time the enterprise did not produce electricity and specialised in delivering heat to “Alabuga”, and in September 2016 the management company of the FEZ bought the PHP from the “Generating Company” in order to attract large heat consumers. Gas supply is being carried out from the gas distribution station "Central" of the gas pipeline "Mozhga — Yelabuga". Transport accessibility of "Alabuga" is provided by a two-kilometre road that connects the site with the federal highway M7, a river communication with access to the Unified Deep Water System of European Russia through the ports in Naberezhnye Chelny and Nizhnekamsk, the international airport Begishevo and non-public railway to Tikhonovo station at the Kuybyshev Railway. In 2016, the SEZ management company planned the construction of an additional railway line to meet the growing needs of the residents. A cargo express is planned to be launched in 2017, which will connect the Kuibyshev and Gorky Railway, and will run along the route Sukhobozvodnoye-Tikhonovo and supply quartz sand to Alabuga for the glass production. An equipped container platform for cargo shipment has been operating in Alabuga since January 2008. Yelabuga customs post of the Tatarstan customs office, established a year earlier, started working in April 2008. The area of its activity is limited by the territory of the SEZ "Alabuga". The on-site post with 46 employees has been located in the administrative and business centre and became part of the "one-stop-shop" system for resident companies. The free customs zone was opened in Alabuga along with the customs post. According to the results of 2014, Yelabuga customs post was declared the best customs post in Russia. In 2015, two industrial parks were opened on the territory of "Alabuga": “Synergy” and “A Plus Park Alabuga”, whose sites are rented by resident companies for production purposes. "Synergy", which is an area of 24500 m², offers standard modules of two types, including production areas as well as administrative and utility spaces. 200 thousand m² of the industrial area, warehouses and A-class office space are available in “A Plus Park Alabuga”. Plans for the SEZ "Alabuga" development include construction of housing for employees of resident companies. The "Three Bears" suburban settlement with a total area of 40.47 hectares, located 7 km from the SEZ, was completed in 2014. The village includes 40 two-storeyed cottages, an international Alabuga International School with advanced study of English, a kindergarten at the school, a house for teachers and specialists, two boiler houses, water intake and water treatment facilities. There are also recreational areas, a public centre, a sports complex, a restaurant and a shop. In October 2016, "Alabuga" acquired the hotel complex Alabuga City Hotel, which opened in 2009 in the historical part of Yelabuga. The SEZ management planned to reprofile the hotel to accommodate employees of resident companies, sent to Alabuga, and in 2017 chose “Ramada” international network to be its operator. Other plans of the SEZ development include the construction of the "Severny" micro-district in Alabuga with an area of 115.9 hectares, which will include 209 individual houses with a total area of 33.4 thousand m² and an apartment building of 242 thousand m², which will ensure the population of 9453 people. Schools, kindergartens, a public centre and a park area of 19.6 hectares are planned to become a part of the future micro-district. Alabuga’s corporate university started to work in 2016 - it is a training program for senior executives of the resident companies. Training is based on the case study method, includes master classes on marketing, strategic management and production management, which are conducted by the heads of the SEZ and the resident companies. Within the framework of the educational program, students do training in various divisions of the "Alabuga" Directorate and develop projects to address the real needs of the administration and residents of the SEZ. The second class of students graduated in April 2017. The managing company of the special economic zone is JSC “SEZ IPT «Alabuga»”, whose shareholders are the Russian Federation through the state-owned JSC “Special Economic Zones” (66%) and the Ministry of Land and Property Relations of the Republic of Tatarstan (34%). According to the reports of JSC “SEZ IPT «Alabuga»” of 2014, 590 employees worked for the management company of the special economic zone. The management company interacts with state authorities and does IR-support of the SEZ. Since 2009, JSC “SEZ IPT «Alabuga»” carries out voluntary certification of quality management. In 2013, Alabuga received a certificate of compliance with the requirements of GOST 9001-2011 (ISO 9001: 2008). In 2014, the Federal Agency for Technical Regulation and Metrology issued to the management company of the SEZ a certificate of compliance of the environmental management system and a certificate of compliance of the health and safety management. The activity of JSC “SEZ IPT «Alabuga»” is controlled by the Board of Director; the General Director performs operational management. "Alabuga" is the largest and most successful special economic zone of industrial and production type in Russia: it accounts for 68% of the total revenue of all SEZs in the country (as of 2017), private capital investments in "Alabuga" make 54% of all funds invested in the SEZ in Russia (as of 2016). By 2017 Alabuga signed contracts for investments totalling 155.8 billion roubles (4.5 billion US Dollars), of which 100.2 billion rubles (3.1 billion US Dollars) were used. The largest foreign investors are from the Netherlands and Turkey. In total, resident companies created more than 5.6 thousand jobs in "Alabuga". In 2016 "Alabuga" accounted for 42% of the taxes (excluding VAT) of all special economic zones of Russia. From its start to 2016, its residents paid 9.7 billion roubles of taxes (including 2.6 billion roubles, or 42.42 mln US Dollars, in 2015). Evidence of the effectiveness of "Alabuga" is that the growth of tax revenues of residents exceeds tax expenses — the aggregate of tax privileges granted to them. The President of the Republic of Tatarstan Rustam Minnikhanov estimates the tax revenues to fully cover 25.7 billion roubles of state investments in the infrastructure of "Alabuga" by 2019. According to the plan, by 2023 the number of residents will reach 120, the volume of annual tax deductions — 32 billion roubles a year (476 mln U.S. Dollars at the average annual exchange rate of the ruble to the dollar in 2016). The procedure of obtaining the status of the resident is defined by law: a company must register legal entity in Yelabuga municipal area and present a business plan with investments not less than 120 million roubles. The application is considered by the Alabuga supervisory board. The average period of obtaining the status of a resident is three months. By October 2017, 57 companies were registered as residents, 23 plants were put into service, others being under construction or projected in Alabuga. Taxation of the Alabuga residents is carried out in accordance with the Russian laws of the special economic zones. The resident companies have some tax preferences and benefits, defined by federal legislation and legislation of Tatarstan. According to the Free economic zone regime, the imported equipment and products used in the territory of Alabuga are exempt from the сustoms duties (10%) and the value-added tax (18%). Drylock Technologies — a plant of a Belgian company Drylock technologies producing hygiene products. The enterprise opened on October 8, 2016. Trakya Glass Rus — a joint project of a Turkish holding Şişecam (70%) and the French company Saint-Gobain producing flat glass, mirrors and glasses with spraying. The plant produces 230 thousand tons of flat glass per year. The enterprise opened on October 8, 2016. Automotive Glass Alliance Rus — automotive glass production manufacturing 800 thousand sets per year. The company opened on October 8, 2016. Dizyan Rus Alabuga — the polymer pipes production of the Turkish company Dizayn group. 23,3 thousand tons of product is manufactured per year. The company operates since November 25, 2015. Armstrong Building Products — a dropped ceiling systems plant of Armstrong World Industries company. The declared production capacity — 22 million sqm per year. The enterprise open on 9 June 2015. Havi Logistics Yelabuga — production and distribution centre of Havi Logistics company [de], which provides delivery for McDonald's chain of restaurants. The complex includes 5832 sqm of warehouses and 1080 sqm of the administrative area; it was put into operation in June 2015. Huhtamaki Foodservice Alabuga — a manufacturer of disposable tableware is owned by the Finnish Huhtamäki and collaborates with McDonald’s chain of restaurants. The production line, designed to produce 641 million items per year, was launched in June 2015. Alabuga-Fiber — a carbon fibres manufacturer. The opening ceremony was on 15 May 2015. Hayat Kimya — a sanitary hygienic paper manufacturer (toilet paper towels, napkins and tissues). Projected capacity is 65 thousand tons of products per year. The production was launched in March 2015. Interskol-Alabuga — a manufacturer of power tools and small mechanisation tools. The company was launched in October 2014. The projected capacity of the existing manufacturing line - 1,25 million pieces of equipment per year. 2nd and 3rd stages are under construction. That will increase production to up to 5 million pieces of equipment per year. Kastamonu Integrated Wood Industry — a subsidiary of a Turkish manufacturer MDF, producing melamine coated and uncoated medium-density fibreboards, flooring and furniture panels. The enterprise’s projected capacity is 457 thousand sqm per year. It was officially opened in September 2014. Coşkunöz Alabuga — a plant of a Turkish company Coşkunöz Holding [tr]. It produces car metal body parts for Ford Sollers holding Ltd. The company opened on August 29, 2014. RMA-Rus — a steel ball valves production. The enterprise was launched in May 2014. Projected capacity is 11 thousand units of products per year. Saria Bio-Industries Volga — a production of technical and feeding fat, bone meal from animal waste. The company belongs to German SARIA Bio-Industries. The company has operated since September 2013. Vertical-Alabuga — concrete and reinforced concrete production. The capacity is up to 94 thousand m3 per year. The company has operated since 2013. Belaya Dacha Alabuga — salads and vegetable products processing plant. Capacity is 12 thousand tons of products per year. The launch of production was held on August 29, 2012. Rockwool-Volga — a subsidiary of Rockwool International, a Danish manufacturer of mineral wool. The factory was launched in April 2012 and became one of Europe's largest enterprises producing wool heat insulating products. Ford Sollers Elabuga — car and engines production, a joint venture of Ford and Sollers companies. The projected capacity — 85 thousand cars and 185 thousand engines per year. The automotive plant began to work in January 2012. Engine plant was put into operation on September 3, 2015. Air Liquide Alabuga — a subsidiary of Air Liquide; industrial gas production. The first stage of the enterprise (air-distribution installation for the needs of P-D Tatneft-Alabuga Fiberglass) was put into operation July 2010, the second — in May 2012. In August 2014 a complex producing the hydrogen-nitric mixture for the plant "Trakya Glass Rus" was launched. P-D Tatneft-Alabuga Fiberglass — a company which manufactures fiberglass and products on its basis. The first stage the production was launched in November 2009. Projected capacity — 21 thousand tons of ready products per year. Polimatiz — an enterprise manufacturing nonwoven fabric on the basis of polypropylene. Production capacity is more than 17 thousand tons of ready product per year. The production was launched in July 2009. In December 2016, Alabuga reached a principal agreement on cooperation with the Tianjin Economic-Technological Development Area (TEDA), one of the first and most successful free economic zones in China. Among prospects were: attracting more than 60 resident companies from China to the Tatarstan special economic zone; making TEDA the Alabuga shareholders through selling them one part of the additional emission of JSC "SEZ IPT Alabuga" shares, planned for 2018-2019; creating a joint venture - the audit-consulting firm PriceWaterhouseCoopers was engaged in the development of this project. At the St. Petersburg International Economic Forum in 2017, the Republic of Tatarstan and Rosatom State Atomic Energy Corporation signed an agreement to build a plant in Alabuga to produce polyacrylonitrile fiber, the main raw material for the production of carbon fiber. The construction is planned for 2017-2020. When it reaches the projected capacity the enterprise will provide 700 jobs. It is planned that the plant will become a key investment project of an interregional composite industrial cluster that will unite the branch capacities of the Republic of Tatarstan, Moscow and Saratov regions into a single technological cycle for the production of composite materials. Since 2012, "Alabuga" has been included in the ratings of the best free economic zones fDi Intelligence — The Financial Times business unit. In the 2012-2013 rating, "Alabuga" was ranked #40. In 2014, it was awarded an honourable mention in the regional category (Europe). In the global ratings of 2015, 2016 and 2017, "Alabuga" was named the best special economic zone in Europe for large business. In 2016 and 2017, it also received an honourable mention in the global ranking of the SEZ for large companies. “Alabuga” also received Russian industry awards: in particular, at the St. Petersburg International Economic Forum in 2015, the special economic zone was granted the Vnesheconombank's Development Prize as the "Best Project of Complex Territory Development”. ^ a b c Annual report of 2015, p. 42. ^ Annual report of 2015, p. 39. ^ Annual report of 2015, p. 14. ^ a b Yakovleva 2013, pp. 22—24. ^ a b c Yakovleva 2013, pp. 25—35. ^ a b c d Yakovleva 2013, pp. 41—45. ^ a b Shamil Idiattulin (2003-03-24). "Век зоны не видать" [No zone for a century.] (in Russian). Kommersant. Retrieved 2017-10-26. ^ Yakovleva 2013, p. 62. ^ Annual report of 2014, pp. 10—11. ^ Sergey Afanasyev (2016-07-05). "10-летие ОЭЗ "Алабуга": "наполеоновские" планы Гафурова, "турецкий вопрос" и визит Ли Куан Ю" [10th anniversary of the SEZ "Alabuga": plans Gafurov’s grandiose plans, "the Turkish question" and the visit of Lee Kuan Y.] (in Russian). Realnoe vremya. Retrieved 2017-10-26. ^ Planning project for the SEZ PPT "Alabuga" 2015, pp. 29—30. ^ Annual report of 2014, p. 24. ^ "ОЭЗ "Алабуга" вышла на максимальный уровень надежности энергоснабжения" [10th anniversary of the SEZ "Alabuga": plans Gafurov’s grandiose plans, "the Turkish question" and the visit of Lee Kuan Y.] (in Russian). Office of the President of the Republic of Tatarstan. 2014-12-08. Archived from the original on 2017-09-14. Retrieved 2017-10-26. ^ Planning project for the SEZ PPT "Alabuga" 2015, pp. 30—31. ^ Planning project for the SEZ PPT "Alabuga" 2015, p. 31. ^ a b Planning project for the SEZ PPT "Alabuga" 2015, pp. 31—32. ^ ""Генерирующая компания" продала Елабужскую ТЭЦ управляющей компании "Алабуги" за 280 млн рублей" ["Generating Company" sold Yelabuga CHPP to the "Alabuga" management company for 280 million rubles] (in Russian). Kommersant. 2016-09-27. Retrieved 2017-10-26. ^ ""Генерирующая компания" продала ОЭЗ "Алабуга" Елабужскую ТЭЦ за 280 млн рублей" ["Generating Company" sold Yelabuga CHPP to the "Alabuga" management company for 280 million rubles] (in Russian). Expert Tatarstan. 2016-09-28. Retrieved 2017-10-26. ^ "Мощности Елабужской ТЭЦ направят на обеспечение будущих тепличных комплексов" [The capacities of the Yelabuga CHPP plant will provide future for greenhouse complexes] (in Russian). IA Tatar-Inform. 2016-09-28. Retrieved 2017-10-26. ^ "РЖД Логистика открыла диспетчерский центр на полигоне ОЭЗ "Алабуга"" [RZD Logistics opened a dispatch center at the polygon of the SEZ "Alabuga"] (in Russian). InfraNews. 2013-12-16. Retrieved 2017-10-26. ^ "ОЭЗ "Алабуга" вложит около 1 млрд рублей в развитие железной дороги на своей территории" [SEZ "Alabuga" will invest about 1 billion rubles in the development of the railway on its territory] (in Russian). TASS. 2016-11-24. Retrieved 2017-10-26. ^ "Грузовой экспресс для особой экономической зоны" [Freight express for the special economic zone] (in Russian). Gudok. 2016-12-13. Retrieved 2017-10-26. ^ M.I. Sklyar (2007). "Особые экономические зоны в Российской Федерации" [Special economic zones in the Russian Federation]. National interests: priorities and security (Национальные интересы: приоритеты и безопасность) (7(16)): 34–40. ^ "Особая экономическая зона промышленно-производственного типа "Алабуга"" [Special economic zone of the industrial-production type "Alabuga"] (PDF) (in Russian). Vnesheconombank. Retrieved 2017-10-26. ^ Annual report of 2015, p. 62. ^ "Сегодня будет создан первый таможенный пост в особой экономической зоне "Алабуга"" [The first Customs post will be created today in a special economic zone "Alabuga"] (in Russian). Everything about customs (Всё о таможне). 2007-06-01. Retrieved 2017-10-26. ^ "Альберт Мавликов посетил ОЭЗ "Алабуга"" [Albert Mavlikov has visited SEZ "Alabuga"] (in Russian). IA Tatars-inform. 2009-01-16. Retrieved 2009-01-16. ^ "Таможенный пост ОЭЗ "Алабуга" стал лучшим в России" [Customs post of the SEZ "Alabuga" has become the best in Russia] (in Russian). IA Tatars-inform. 2015-02-21. Retrieved 2017-10-26. ^ Annual report of 2015, p. 10. ^ "Готовые производственные площади" [Ready production areas] (in Russian). Vedomosti. Archived from the original on 2015-07-01. Retrieved 2017-10-26. ^ Michal Kaczmarski (2014). "A place to stay". fDi Intelligence. October/November: 76–78. ^ Christina Ivanova, Artem Malyutin (2016-10-13). "ОЭЗ "Алабуга" купила гостиницу и хочет дать ей международное имя" [SEZ "Alabuga" has bought a hotel and wants to give it an international name] (in Russian). Kazan First. Retrieved 2017-10-26. ^ Annual report of 2014, p. 17. ^ "Кембридж контролирует обучение в Татарстане" [Cambridge controls the training in Tatarstan] (in Russian). Metro. 2014-09-05. Retrieved 2017-10-26. ^ "В Елабуге завершено строительство жилых домов в ЖК "Три медведя"" [Residential estate “Three bears” has been completed in Yelabuga] (in Russian). BN-newspaper. 2014-07-28. Retrieved 2017-10-26. ^ "В Елабуге открылась международная школа Alabuga International School" [Alabuga international school has opened in Alabuga] (in Russian). Business online. 2014-09-08. Retrieved 2017-10-26. ^ Alexander Shakirov (2017-07-10). "Ramada заселилась в "Алабугу"" [Ramada made a check-in in "Alabuga"] (in Russian). Realnoe vremya. Retrieved 2017-10-26. ^ Planning project for the SEZ PPT "Alabuga" 2015, pp. 10—11. ^ Planning project for the SEZ PPT "Alabuga" 2015, p. 36. ^ "Университет за три месяца" [A university in three months] (in Russian). Republic of Tatarstan. 2017-09-03. Retrieved 2017-10-26. ^ "В корпоративном университете ОЭЗ "Алабуга" состоится второй выпуск студентов" [The second set of students will graduate the corporate University of the SEZ "Alabuga"] (in Russian). IA Tatars-inform. 2017-04-24. Retrieved 2017-10-26. ^ "Татарстан компенсирует затраты администраторов особых экономических зон. Цена вопроса — четверть миллиарда рублей" [Tatarstan will compensate the administrators costs at the special economic zone. The price is a quarter of billion rubles] (in Russian). Kazanfirst. 2016-08-26. Retrieved 2017-09-01. ^ Annual report of 2014, p. 16. ^ Annual report of 2014, p. 62. ^ Annual report of 2014, pp. 66—77. ^ a b c d "Экспертный совет ОЭЗ "Алабуга" одобрил проекты на 650 миллионов рублей" [The SEZ “Alabuga” Expert Council approved projects worth 650 million rubles] (in Russian). RIA Novosti. 2017-05-15. Retrieved 2017-10-26. ^ a b c Olga Sinenko, Igor Mayburov (2017). "Comparative Analysis of the Effectiveness of Special Economic Zones and Their Influence on the Development of Territories". International Journal of Economics and Financial Issues. 7 (1): 115–122. ISSN 2146-4138. ^ Ильдар Аюпов (2016-07-11). "ОЭЗ «Алабуга» окупит госвложения в инфраструктуру в 2019 году" [SEZ "Alabuga" will recoup the state investment into its infrastructure in 2019] (in Russian). RBC. Retrieved 2017-10-26. ^ a b ""Алабуга" в третий раз подряд признана лучшей ОЭЗ в Европе" ["Alabuga" has become the best SEZ in Europe for the third time] (in Russian). Business Online. 2014-10-09. Retrieved 2017-10-16. ^ "Налоговые льготы, действующие на территориях ОЭЗ" [Tax advantages acting on the SEZ territories] (in Russian). SEZ “Alabuga”. Retrieved 2017-10-26. ^ "ОЭЗ Алабуга" [SEZ “Alabuga”] (in Russian). Publishing House "Tax news". Retrieved 2017-10-26. ^ "Рустам Минниханов принял участие в открытии завода "Драйлок-Технолоджиз" в ОЭЗ "Алабуга"" [Rustam Minnikhanov took part in the opening of the plant "Drylock Technologies" in SEZ "Alabuga"] (in Russian). Tatar-inform. 2017-09-13. Retrieved 2017-10-16. ^ a b "Рустам Минниханов открыл турецкие стекольные заводы в ОЭЗ "Алабуга"" [Rustam Minnikhanov opened the Turkish glass plants in SEZ "Alabuga"] (in Russian). Business Online. 2016-10-08. Retrieved 2017-10-26. ^ "Турецкое производство полимерных труб в ОЭЗ Алабуга откроется 25 ноября" [Turkish production of polymer pipes in SEZ “Alabuga” opens on November 25] (in Russian). Information and analytical Center Rupec.ru. 2015-11-19. Retrieved 2017-10-26. ^ a b c d e f g h i Annual report of 2014, pp. 43—50. ^ "В ОЭЗ "Алабуга" открылся завод "3М Волга"" ["3M Volga" plant opened in SEZ “Alabuga”] (in Russian). Yelabuga municipal area. 2015-10-21. Retrieved 2017-10-26. ^ "В ОЭЗ "Алабуга" открылся первый в РФ завод по производству навесных потолочных плит" [The first in Russia dropped ceiling plant opened in SEZ “Alabuga”] (in Russian). Business Online. 2015-07-09. Retrieved 2017-10-26. ^ a b "Выборный вопрос и разовая посуда: Татарстан 3 июня" [Elected question and disposable tableware] (in Russian). Regnum. 2015-06-03. Retrieved 2017-10-26. ^ "В ОЭЗ "Алабуга" открылся завод по производству углеродного волокна стоимостью 3 млрд рублей" [A carbon fiber plant worth 3 billion roubles opened in SEZ “Alabuga”] (in Russian). Business Online. 2015-05-15. Retrieved 2017-10-26. ^ ""Алабуга" приютила турецкую компанию "Хаят Кимья"" ["Alabuga" sheltered Turkish company "Hayat Kimya"] (in Russian). Vesti economics (Вести Экономика). 2015-03-30. Retrieved 2017-10-26. ^ "Компания "ИНТЕРСКОЛ": история, вызывающая гордость" [“Interskol” company: a story to be proud of. National award in the field of import substitution] (in Russian). National award in the field of import substitution. 2016-09-28. Retrieved 2017-10-26. ^ "Рустам Минниханов: "Я говорю Когогину: поехали на открытие штамповки. Он: мы пока еще не вполне договорились..."" [Rustam Minnikhanov: "I say to Kogogin: let’s attend the opening of stamping. He: we don’t fully agree yet..."] (in Russian). Business Online. 2014-08-29. Retrieved 2017-10-26. ^ "В ОЭЗ "Алабуга" запущен завод по переработке отходов мясопереработки с объемом инвестиций в 38 млн. евро" [The meat-processing plant with investment of 38 million euros has opened in SEZ “Alabuga”] (in Russian). Business Online. 2013-09-09. Retrieved 2017-10-26. ^ "Резид��нты ОЭЗ "Алабуга" произвели продукции на сумму более 55 млрд. рублей" [The SEZ "Alabuga" residents have produced good worth more than 55 billion roubles] (in Russian). Business Online. 2014-07-04. Retrieved 2017-10-26. ^ "Рустам Минниханов принял участие в открытии завода "Белая дача" в ОЭЗ "Алабуга"" [Rustam Minnikhanov took part in the launch of the plant "Belaya dacha" in SEZ "Alabuga"] (in Russian). Business Online. 2012-08-29. Retrieved 2017-10-26. ^ "В ОЭЗ "Алабуга" произведено 10.000 автомобилей Ford" [10.000 Ford cars have been produced in SEZ “Alabuga”] (in Russian). Russia. Special economic zones. 2012-09-21. Retrieved 2017-10-26. ^ "Ford запустит производство двигателей в России" [Ford will launch engine production in Russia] (in Russian). Slon.ru. 2015-09-03. Retrieved 2017-10-26. ^ "Первая очередь "П-Д Татнефть Алабуга Стекловолокно" заработает через 2 месяца" [The first part of P-D Tatneft-Alabuga Fiberglass will be launched in 2 months] (in Russian). Business Online. 2009-09-29. Retrieved 2017-10-26. ^ ""Алабуга" договорилась о сотрудничестве с ведущей ОЭЗ Китая" ["Alabuga" has agreed on cooperation with the leading SEZ of China] (in Russian). Rambler News. 2016-12-19. Retrieved 2017-10-26. ^ Olga Kudrina (2017-08-02). "60 компаний из Китая могут открыть производства в Татарстане с инвестициями 180 млрд рублей" [60 companies from China can open production in Tatarstan with investment of 180 billion roubles] (in Russian). Kommersant. Retrieved 2017-10-26. ^ Olga Kudrina (2016-12-26). "Chinese TEDA can become a co-owner of the SEZ "Alabuga" management company" (in Russian). Kommersant. Retrieved 2017-10-26. ^ "Росатом построит в ОЭЗ "Алабуга" новый завод углеродного сырья" [Rosatom will build a new carbon fibers plant in the SEZ "Alabuga"] (in Russian). EnergyLand.info. 2017-06-03. Retrieved 2017-10-26. ^ "Завод по выпуску ПАН-прекурсора в "Алабуге" станет ключевым проектом российского композитного кластера" [PAN-precursor production in “Alabuga” will be a key project of the Russian composite cluster] (in Russian). Expert Tatarstan. 2017-07-06. Retrieved 2017-10-26. ^ Gráinne Byrne, Courtney Fingar (2012). "Global Free Zones of the Future 2012/13 Winners" (PDF). fDi Intelligence (June/July): 20–30. ^ Cathy Mullan (2014). "Global Free Zones of the Year 2014 — Winners" (PDF). fDi Intelligence (October/November): 16–24. ^ Maria Chernysheva (2015-06-29). "Первая среди особых" [The first among the special] (in Russian). Kommersant. Retrieved 2017-10-26. ^ "ОЭЗ "Алабуга" удостоена Премии развития "Внешэкономбанка"" [SEZ "Alabuga" won the Development Award of "Vnesheconombank"] (in Russian). Agency of investment development of the Republic of Tatarstan. 2015-06-19. Retrieved 2017-10-26. Yakovleva, I.N., ed. (2013). Индустриализация 2.0 на примере площадки Особой экономической зоны "Алабуга" [Industrialization 2; case study of the Special economic zone "Alabuga"] (in Russian). Kazan: Tatmedia. p. 135. Annual report of 2014 [Annual report of 2014] (PDF) (in Russian). OJSC "Special Economic zone «Alabuga»". p. 110. Annual report of 2015 [Annual report of 2015] (PDF) (in Russian). OJSC "Special Economic zone «Alabuga»". p. 148. Проект планировки Особой экономической зоны промышленно-производственного типа на территории Елабужского муниципального района Республики Татарстан и прилегающей территории [Project plan of the Special economic zone of industrial and production type on the territory of Yelabuga municipal district of the Republic of Tatarstan and surrounding area] (PDF) (in Russian). 2015. p. 65.